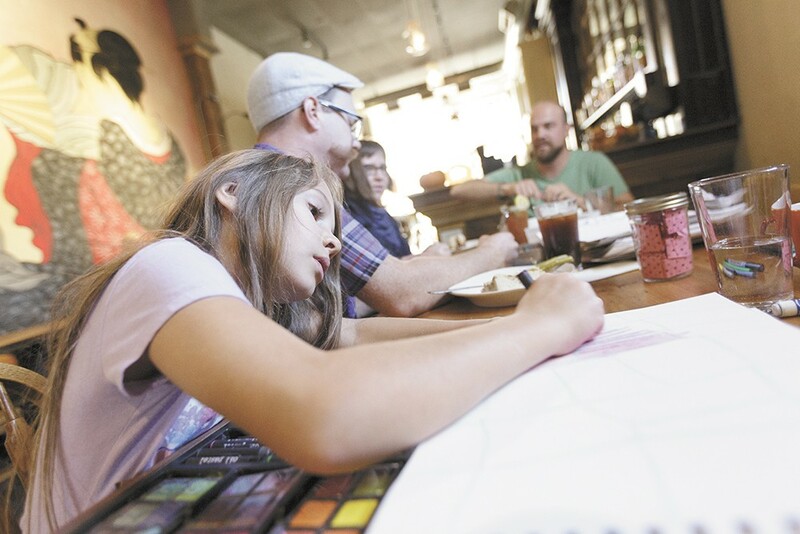 Jasmine Bollar, 8, drew artistic inspiration from "The Jar of Random," a word bank in a jar. Colored pencils, markers and ink pens are strewn across a table in the back corner of Boots Bakery & Lounge. A plastic cup of murky, gray water sits near a miniature palette of watercolors, and in the center is a towering stack of paper — "the pile" — which grows taller during each Social Sketch meetup. Attendance at September's event is lower than usual, but the three artists sticking out the last hour of the afternoon gathering say a smaller group is just as conducive to artistic collaboration as a session with up to 30 participants. Held monthly on the last Sunday, anyone is welcome to bring their art supplies and spend an afternoon working on individual projects or collaborating with others during the casual, drop-in sessions. With its first gathering in January, Spokane became the second city in the U.S. to host a Social Sketch event — now, it's one of many. The local meetups are organized by prolific local artist Tiffany Patterson, and offer a welcoming space for artists of all ages and skills to come together and draw, paint, talk and learn. Spokane's version is modeled after a similar initiative in the Bay Area that Patterson heard about online. "It's nice to come here and not think about my own projects or sticking to my specific style. I've seen my work change a little bit," Patterson says. "It's a way for me to experiment, because I'm not as committed to these pieces. You're drawing things you'd never draw on your own because someone else started it for you," she adds. Spokane artist Daniel Scully has been coming to the monthly creative gatherings regularly since the first meetup, when Patterson invited him. At the end of the table opposite him sits another regular, Derrick Freeland, a Spokane transplant from Portland who currently works as a social worker and has a background in illustration. Freeland leans over a line drawing of a long-necked dinosaur, adding shadows and detail work with a fine-point pen to the simplistic sketch he didn't draw. Rather, it came from "the pile" — a communal resource of collaborative sketches and doodles from this day and previous months. Patterson brings the evolving collection with her to each session. "The whole idea is that we're collaborating on pieces, so the pile serves as a place to sort of take from and start drawing, and then toss back into the pile," Patterson explains. That afternoon, she puts the finishing touches on a cheery, colorful mash-up of smiling houses, flowers, foliage, geometric shapes and repeating patterns. The completed piece then goes back into the pile, and anyone who worked on it, or simply admires any piece, is welcome to keep it, she says. Next to "the pile" is a Mason jar filled with folded slips of pink paper, each printed with a single noun or verb — like a game of charades, but for creative inspiration. Dubbed the "Jar of Random," a pair of children who'd dropped in with a parent earlier explored its contents for ideas, including words like parrot, cactus, enchant, bumblebee, donut, ghost, poison, parrot and myth. Evidence of the children's creative efforts has since joined the communal stack of sketches. Perhaps next month another artist will pick up where the kids left off. 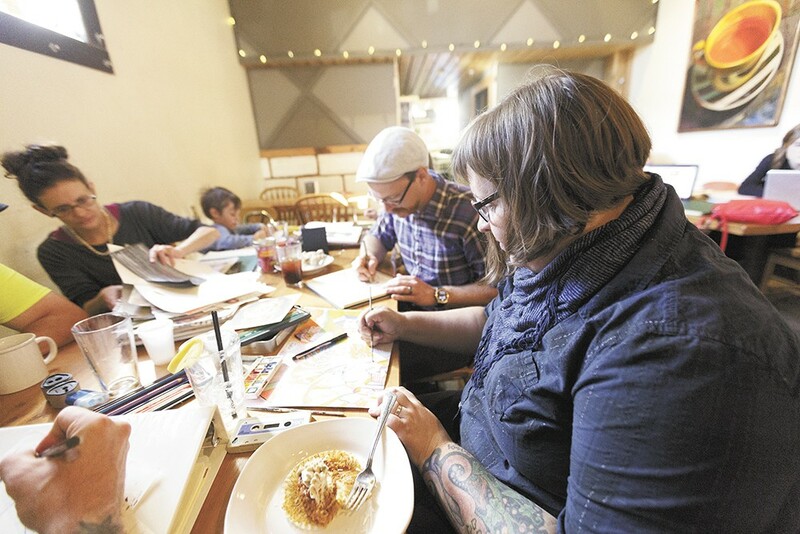 Artist Tiffany Patterson founded Spokane's Social Sketch in January. Beyond the collaborative art process and camaraderie, a highlight of Social Sketch for Scully is to "talk shop with other artists." "It's a good creative exercise... when you're with other artists, you see different ways to do things that you wouldn't have thought of," he explains. "We definitely like to feed off each other as far as creativity goes," Patterson chimes in. "And sharing art supplies and learning about other people's supplies has been really fun — just nerding out about art supplies." Ten years ago, or maybe less, Patterson believes Spokane's arts community wouldn't have been able to support an event like Social Sketch. "I think there's been a lot of momentum as far as artists being here, and being social and networking... there's more of a community than there ever was, and seeing what other people can do, I think we're all inspiring each other to reach out and include more in the art scene and make it more community based," she reflects. This notion of community is a top priority at Social Sketch. Although it was started by a widely recognized young artist and is regularly attended by others with formal arts backgrounds, anyone can come create and learn alongside them. And for many of these professionals, the sessions are a way to relieve stress and escape expectations of their regular work.